If you have a compatible Bluetooth® audio device that is capable of playing audio files, the device can be connected to the vehicle’s audio system so that the audio files on the device play through the vehicle’s speakers. Press the [ ] button. Touch the “Phone & Bluetooth” key. Touch the “Connect New Device” key. The system acknowledges the command and asks you to initiate connecting from the phone handset. The connecting procedure of the cellular phone varies according to each cellular phone model. 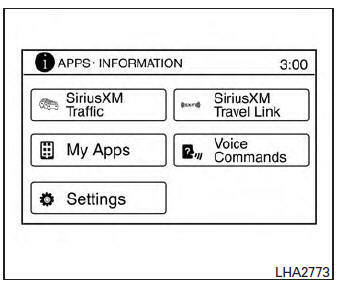 See the cellular phone Owner’s Manual for details. You can also visit www.nissanusa.com/bluetooth for instructions on connecting NISSAN recommended cellular phones. To switch to the Bluetooth® audio mode, press the AUX button repeatedly until the Bluetooth® audio mode is displayed on the screen. 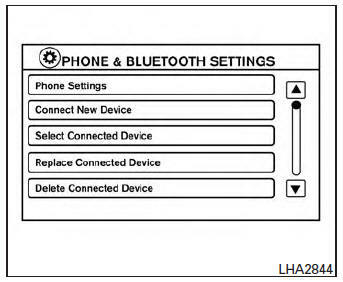 The controls for the Bluetooth® audio are displayed on the screen.